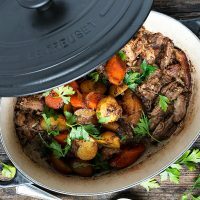 Pork shoulder braised on the stovetop with Marsala wine and vegetables. Heat oil in heavy pot with a lid over medium heat on the stovetop. Pat pork shoulder roast dry and season on both sides with salt and freshly ground pepper. Add to hot pan and cook until browned on the bottom. Flip over and brown the other side. Add the Marsala wine to the pan and allow to boil for 1 minute. Scatter the prepared garlic, onion, carrots and potatoes around the roast. Throw in thyme sprigs (or sprinkle with dried thyme). Season with salt and pepper. Cover pan with lid and reduce heat to medium low. Allow to simmer, covered, for 45 minutes, then stir and flip roast over. Simmer covered for another 45 minutes, then check pork for doneness by pulling on it with a fork. *Note: You don't ever want the pan to be completely dry. If liquid seems thin, add another splash of Marsala, chicken broth or water, to keep it moist. If it comes apart easily, it is done. If not, keep simmering, covered, until it tests done. When pork is ready, remove pot from heat for a moment. Remove pork to a plate. Spoon out vegetables into a bowl. Shred or tear apart pork with two forks. Return pot to burner over medium heat. If making optional gravy (below), proceed with that in the empty pot. Otherwise, return pork to pot with any pan juices and cook over medium low heat for 5-10 minutes. Return vegetables to pot to re-warm. Serve. Optional gravy: After removing the pork and the vegetables from the pan, remove any liquid from the pan. Melt 2 Tbsp butter over medium heat. Stir in 1 Tbsp flour and cook, stirring, for 1 minute. Add 1/4 cup Marsala wine and 1/2 cup chicken broth and cook, stirring, until thickened. Add a splash of cream if you like and season with salt and pepper. Return shredded pork to the pan and stir to combine.